In the clash between humanity and nature, no place in the world straddles that fence quite like South Africa. It’s one of the few places in the world with modern paved roads and massive predatory animals within a few miles of one another. 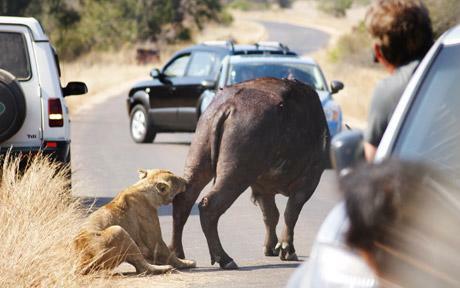 Still, the image of a lioness fighting to bring down a buffalo taken by 24-year-old businessman Muhammed Patel is pretty incredible, if only because it takes place in the middle of busy Orpen Road, with the combatants surrounded by cars. However, the people weren’t the only witnesses. Off to the side of the road, just watching the fight, was a massive male lion who did nothing to help the hunting pack of female lions bring down the massive African buffalo. He’d already successfully fought off the rest of the pack; the lone female fighting with him was the only one still struggling to bring him down. Nature is full of awesome animal fighting spectacles, but rarely do people get to see the action this close up.